Up Helly Aa is an annual fire festival held in Shetland. The festival takes place every last Tuesday of January, in Lerwick, Shetland. 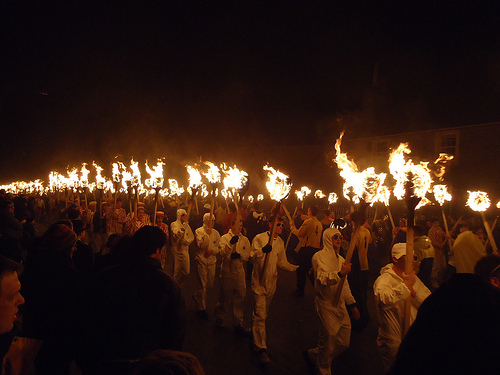 During the festival, squads carrying their Vikings torches in the night march across the town wearing Viking themed costumes. Up Helly Aa is usually held annually to mark the end of the Yule season. A thousand guizers in their Viking costumes walk around burning a wooden, purposely built Viking ship. The festival is one of the region’s major attractions and attracts thousands of visitors every year. The celebration is relatively new. The leader of the ceremony is called a Jarl. The committee is the one that elects the Jarl. The festival is celebrated throughout Shetland and in other locations. Up Helly Aa Festival grew from older New year festivals and the Yule tradition. Squads of young men used to drag barrels of burning tar around town to cause mischief. The young men beat drums, blew horns fired guns and went around shouting on Christmas Eve. Tar barrels were hauled on sleds through the town as well. Torch processions began around 1874 after abolishing tar barreling. The celebrations were then delayed to late January. New ideas emerged, and torch procession was incorporated. The Viking longship was later introduced in 1880 together with Vikings themes. Up Helly Aa grew in popularity after the Second World War and became a major festival. The day involves a series of marches and visitations, with squads in possession of fire torches. Around 7:30 pm. a rocket signal is sent in the sky, flames are lit, and the band begins to play. The Jarl, the official leader of the festival, stands along the longship as the squad follows. The galley is dragged to the burning site by the Jarl’s squad. The men surround the ship while singing the traditional Up Helly Aa song. The Jarl leaves the ship after another rocket gets fired. The hurling of torches in the galley begins after a bugle call rings out. The celebration does not end there, however. It only marks the beginning as the festival continues to the next morning. On the following day, the Viking themed squad goes through Lerwick dancing and performing in halls. Visitors start arriving the next morning in Holmsgarth Terminal for the big party. Up Helly Aa is an absolute blast for the whole family and one that should be on your calendar if you ever visit the region. But there are also other fire festivals in case you missed Lerwick’s Up Helly Aa. Some of the other fire festivals include Scalloway Fire Festival, Lerwick Up Helly Aa, Bressay Up Helly Aa, Cullivoe Up Helly Aa, and many others. Tons of different fire festivals are held in Shetland in various districts and are a must for anyone who wants to experience something truly special. So, if you want to get a taste of old Victorian tradition while enjoying the beautiful Shetlands, make sure that Up Helly Aa is at the top of your list on your next visit.